Esports, and other games : First Official Frisian Draughts World Championships. First Official Frisian Draughts World Championships. 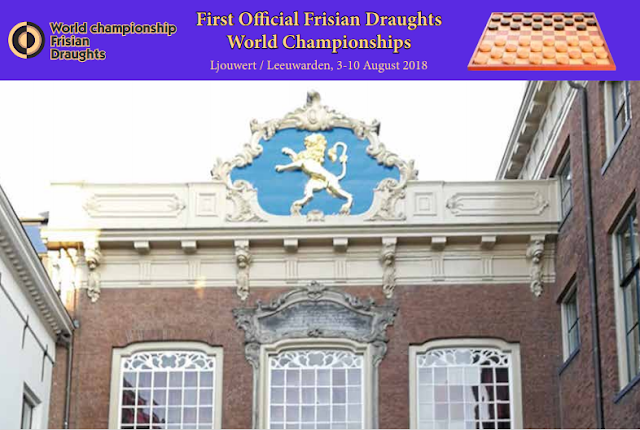 It is with great pride and much pleasure that the organizers of the First Official Frisian Draughts World Championships welcome all participants, volunteers, the general public and other guests to the city of Ljouwert/Leeuwarden, European Capital of Culture 2018. The organisers hope that the tournament will become an event that will set the standard for the future, with participants from all over the world, awesome games, new friendships and, of course, new players of the age-old mind sport of Frisian Draughts, the original variant of 100-square draughts that has been played in the province of Fryslân for more than 400 years. You will be able to follow the games both on Toernooibase (www. toernooibase.kndb.nl) and by live stream on www.frisiandraughts. com. But of course, visitors are very welcome to come to the historic City Hall in Ljouwert (Hofplein 38, 8911 HJ). The Orange Room, decorated with paintings of the sovereigns of the Kingdom of the Netherlands, all descended from the Frisian princely House of Nassau-Dietz, will be used as the playing room. A limited number of visitors will be allowed in on condition that they keep quiet. In the New Room there will be ample opportunity to discuss the various games shown on screen, and to follow the analyses which will be streamed as well. The players will also come to the New Room after finishing their games. The international players are being housed in Duhoux, a hotelrestaurant in the village of Wurdum/Wirdum (Greate Buorren 4-8, 9088 AE) just south of Ljouwert. This hotel used to be the meeting place of the Frisian Draughts Club in Wurdum, and traditionally the first two rounds of the Frisian Championships were played here. Without doubt, there will be opportunities to meet the players and other mind sport players there in the evenings.